Wendy Crawford has had an insanely busy year. 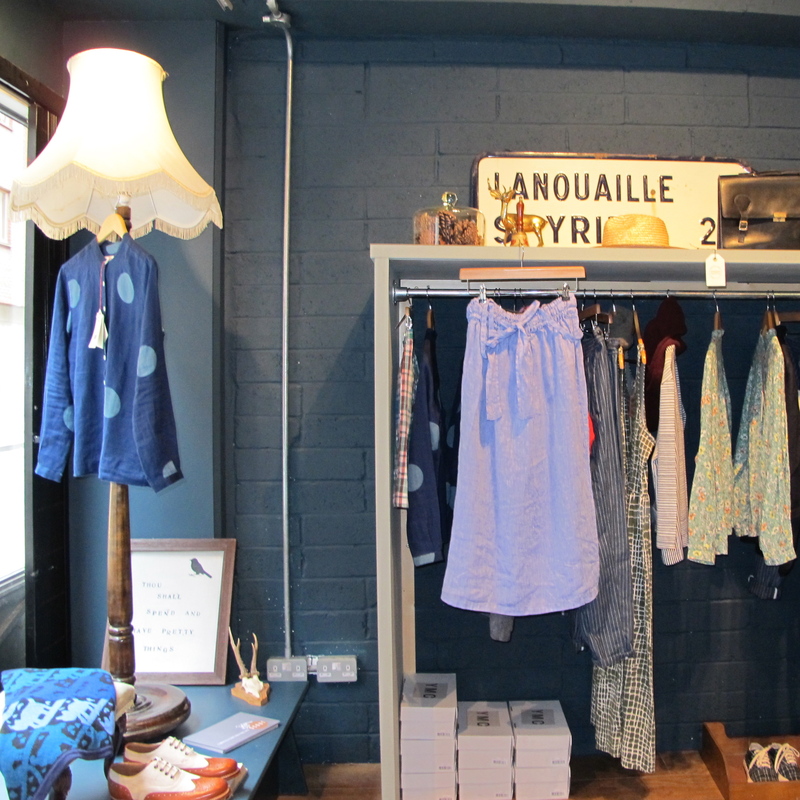 She opened her shop Scout, a new and most welcome addition to the Dublin’s independent retail scene, in March just a scant few weeks after she got married. Incidentally and veering totally off topic there are some lovely images of Wendy’s wedding on photographer Doreen Kilfeather’s blog. They are gorgeous pictures but I did sigh while admiring them as I realized the vast depths of photographic knowledge I have yet to plumb. As I said, Wendy has had a hectic time of late: the Monday after she got married (the wedding was on a Thursday) she was back working, tying up loose ends so that she could wind down Bow the shop she ran since 2009, on a co-op basis, with two other talented creatives – Eilis Boyle and Margaret O’Rourke. Margaret is still at the premises that once was Bow where she now sells mostly jewellery: Eilis has taken her career in another direction, however even though she is no longer designing the ethereally pretty clothes she once did she still has a toe in the fashion water and a selection of her cashmere scarves are sold at Scout. Once the unfolding of Bow was complete Wendy moved on to tackle the transformation of the premises she leased for Scout on Essex Street West in Dublin’s Temple Bar. She chose to christen her new venture Scout as she likes, and is very good at, scouting out new and interesting labels and vintage treasures. And she likes the association with scouting which conjures up images of functionality, Wendy sums this up by saying she likes things to be useful but also beautiful. Scout is a pleasingly calm and aesthetically agreeable space with large plate-glass windows fronting two elevations. 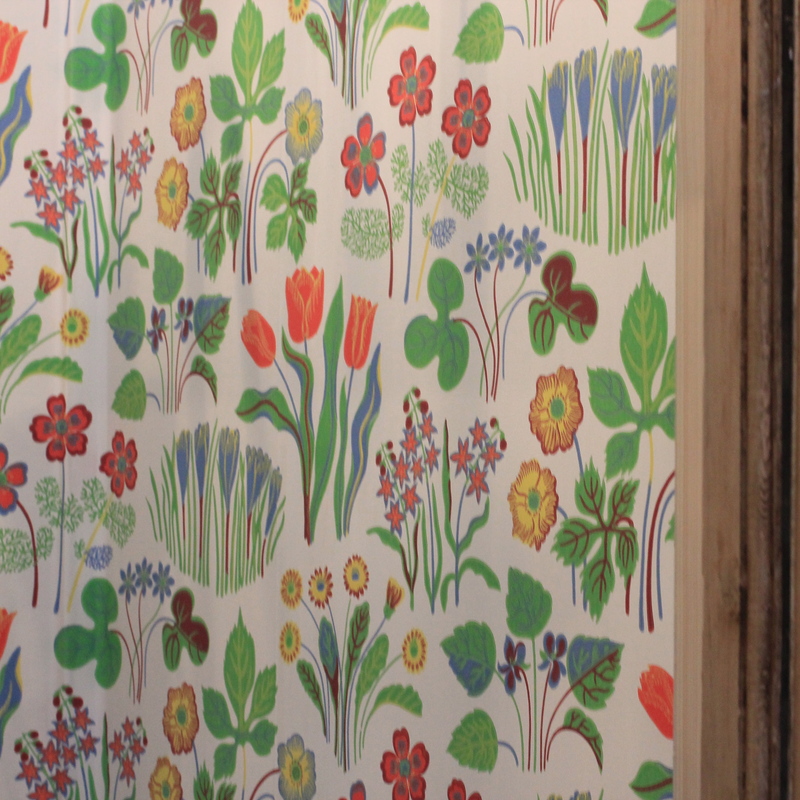 Wendy opted to paint the interior an inky shade of blue which transforms the plain brick walls and gives the shop a cool vibe, added to by the delicious Scandinavian floral wall paper Wendy sourced for the changing room. She has hammered to perfection the art of displaying stock and it is all done beautifully in her inimitable style. Wendy graduated from the NCAD (National College of Art and Design), where she studied embroidered textiles, in 2004 and has worked in fashion including styling since then: that shows in her careful selection of eclectic and stylish merchandise. Scout stocks: clothes, interior goodies, and vintage treasure. 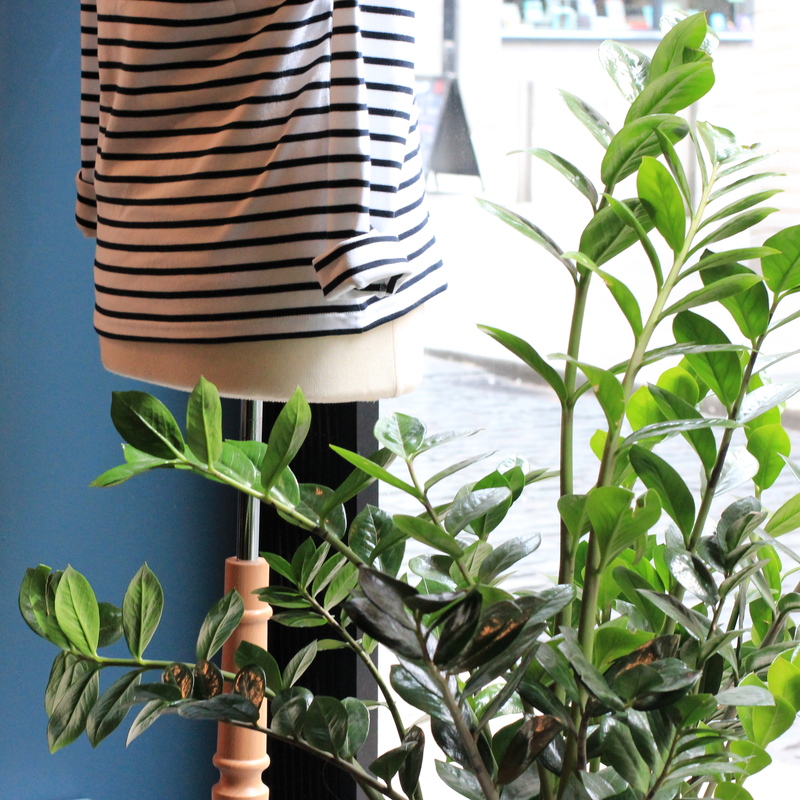 Among the clothes labels are YMC, Fog Linen, Petria Lenehan, and beautiful Bretons from Armor Lux. 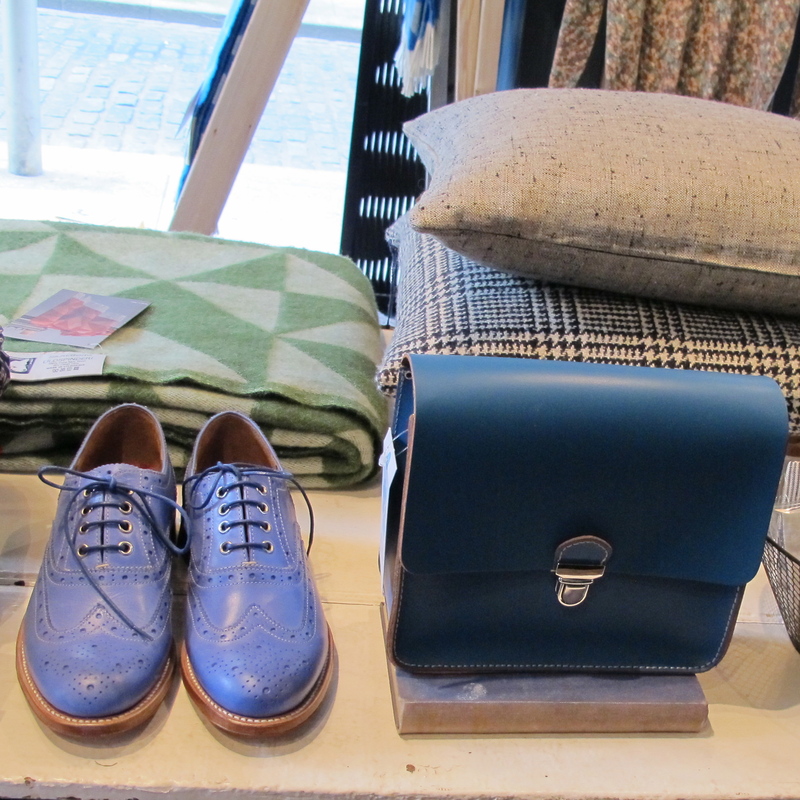 Accessories include bags from Baggu and The Stowe, brogues by Grenson, and the aforementioned cashmere scarves by Eilis Boyle. 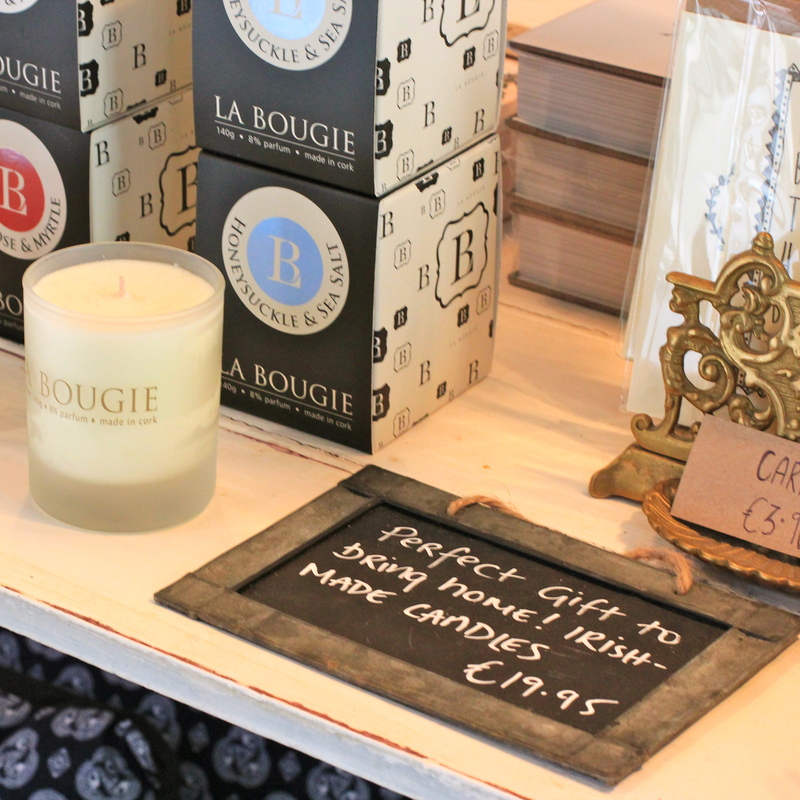 On the interior front you will find linen cushions from 31 Chapel Lane, scented candles by Cork based La Bougie, and woven blankets from Tina Ratzer and Donegal company McNutt. Wendy is keen to increase the range she has on offer so expect Scout to be a constantly evolving concept. I wish her every conceivable success with her new business. What a lovely shop and I did veer over and look at the fantastic wedding photo’ they are so beautifully done. 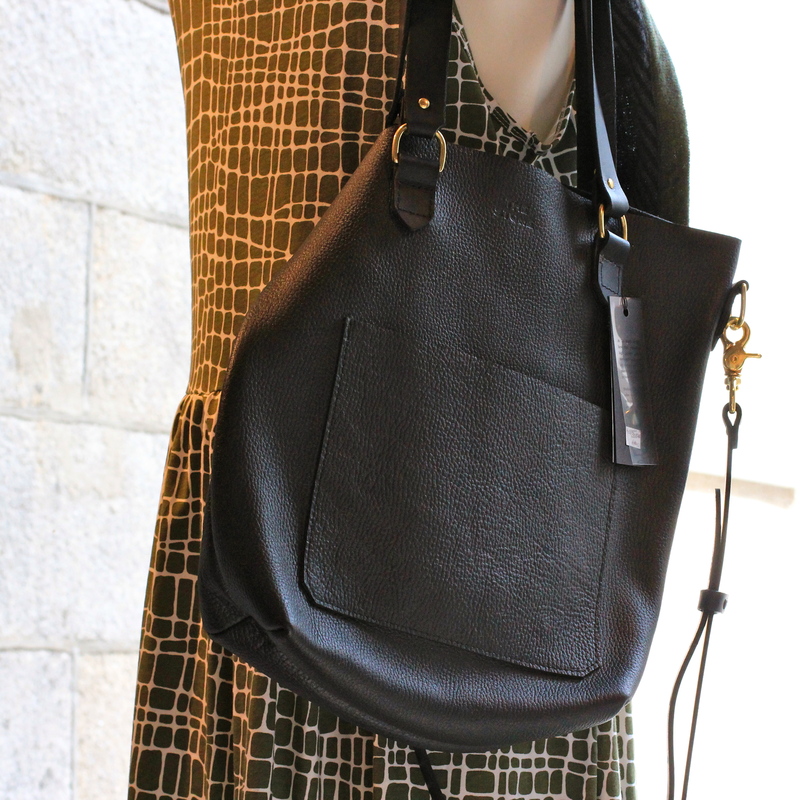 Scout is indeed lovely – I like independent shop as I think add so much to the soul of a city. And those wedding photographs are gorgeous. I thought you hated wallpaper? 😉 Maybe just the one in your house? The shoes are a wonderful shade of blue. I don’t hate wallpaper, I just don’t like the embossed stuff in my place! 🙂 And I am hoping it won’t be too difficult to get it off the walls. Lovely shop and I would love some blue shoes. I think your photos are beautiful. Thank you so very much. I went for the first time tonight to a camera club and saw some amazing images as part of a talk by a freelance photographer – I will never get to that level but there are things I could do to improve. Those shoes are a magical shade of blue. To my untrained eye, I would say your photos have developed considerably since you wrote the post on Bow. Would you agree? I want to be in that shop right now! Love independents that sell a mix of clothes and home wear. Wedding shots are beautiful. Me too. If I am away somewhere I love stumbling upon eclectic independent shops. Isn’t it nice to have such a lovely shop to visit. It is Karen. I think Scout and shops like breathe creative life into the city. A gem is a good way to describe Scout. I’ll be sure to check out her store the next time I’m in Dublin. I love stores like hers. On my last visit I found a similar shop and I bought most of my gifts for friends and family there. Sorry I can’t remember the name of the store off hand. My husband might remember because he also bought my birthday present there. A belated Happy Birthday! You are spot on, although I didn’t mention it in the post, I do feel that Scout is a great place to go present shopping in.